Tom Ewer over at Manage WP has another brilliant article on using boosting engagement (You should also check out his own blog, Leaving Work Behind). He brings up some good points on how to engage. I use #1 with good results on a blog with a lot of product reviews, so the related posts are often an extension of the original post. With #2, it looks very interesting, I am not a big fan of clutter on the post, , but having the star rating on a Google search may be worth it. This is the one I installed here to demo. I agree with Tom on #3, I may use that on my own blog, but I can’t imagine having to keep track of it on multiple blogs. 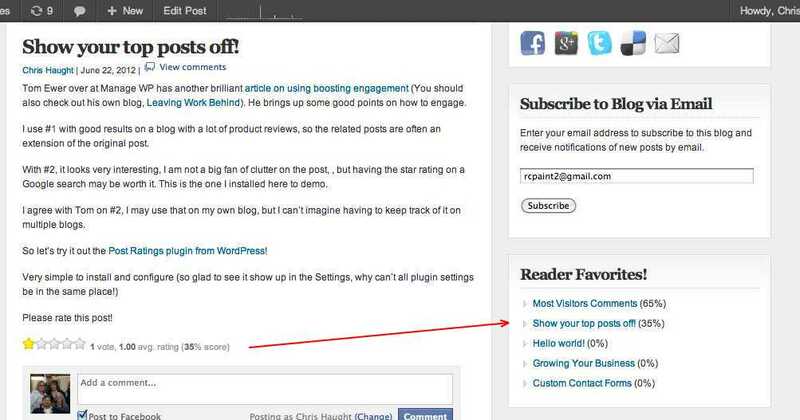 So let’s try it out the Post Ratings plugin from WordPress!